The AF-S DX NIKKOR 18-300mm f3.5-6.3G ED VR is the perfect union of a compact, lightweight body combined with a superior level of optical performance for both images and video, enabling you to capture a diverse range of subjects and situations. Thoughtfully designed with innovations such as the three Extra-Low Dispersion glass elements, the AF-S DX NIKKOR 18-300mm f3.5-6.3G ED VR is a portable lens that delivers brilliance on every count. Capture a variety of subjects in numerous environments with the DX-format AF-S DX NIKKOR 18-300mm f3.5-6.3G ED VR. This high-powered lens delivers superb results through a wide zoom range with a focal length of 18-300mm (27-450mm in 35mm format equivalent) and a zoom ratio of 16.7x. With theAF-S DX NIKKOR 18-300mm f3.5-6.3G ED VR, you can take images that are wide-angle or super-telephoto with one versatile marvel. The AF-S DX NIKKOR 18-300mm f3.5-6.3G ED VR has been meticulously designed with innovative features to deliver high quality images with stunning clarity, particularly when paired with high-pixel-count cameras. The three Extra-Low Dispersion (ED) glass element cuts the incidence of chromatic aberration so your images will not be blurry or clouded by colour fringes around the edges. Three aspherical lenses offer excellent aberration correction performance, so you can capture clean, crisp images with superb resolution. 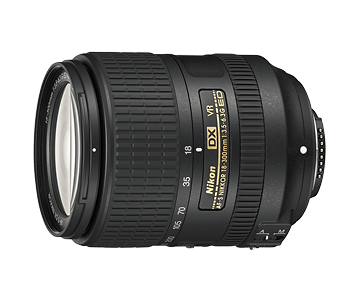 The AF-S DX NIKKOR 18-300mm f3.5-6.3G ED VRs Vibration Reduction (VR) function minimizes camera shake by providing an effect equivalent to a shutter speed 4.0 stops faster*. With the AF-S DX NIKKOR 18-300mm f3.5-6.3G ED VR, you can shoot the clear, precise images you desire, even at full zoom. No matter where you go, the AF-S DX NIKKOR 18-300mm f3.5-6.3G ED VRis easy to carry around. This high-powered, 16.7x zoom lens weighs only around 550g and measures approximately 78.5mm (diameter) x 99mm (length). This compact and lightweight body was achieved by suppressing the open aperture at the maximum telephoto position to f/6.3, so the lens retains its portability without sacrificing performance.